In this episode we take a look into the future of AI and how it might affect organisations and individuals. Host Michael Bird is joined by Dean Gardner, Softcat’s Chief Technologist for cloud as well as Joe Baguley, Vice President and Chief Technology Officer EMEA at VMware, a cloud computing company. Together they discuss the ethical side of AI as well as its potential for development, and also its limitations. There are two types of AI – artificial general intelligence, which looks to replicate the same processes as a human, which is a long way off yet, and task-specific AI, which is focused on one process. The rise in AI will see machines replacing tasks in order for humans to provide better experiences to their customers, augmenting and complementing the human effort. For AI to be effective, you have to teach it, inputting a huge amount of data – it can then process it faster than a human brain, making AI a good fit in medical and legal professions, but the possibilities are wide and varied for using AI in a range of organisations. Organisations can prepare for the rise of machines by ensuring their data is accessible and ready to input to machines in order for them to learn and create efficiencies within their business. Resilience is key to preparing for the future - in your organisation and your people, to be adaptable to, and ready for, change. AI will never be able to learn creativity; human emotion, artistic creativity etc is not something that AI will be able to do. Joe Baguley: IT professionals will get replaced by AI, robots whatever you want to call it. But they've been doing it to themselves forever and they will continue to do it to themselves, and if you're not looking now at stuff that you do today that could be automated in the future, watch out because that's what I'm working on. I'm working on automating that. Michael Bird: Hello and welcome to Explain IT brought to you by Softcat. The show for IT professionals by IT professionals that aims to simplify the complex and often overcomplicated bits of Enterprise IT without compromising on detail. I'm host Michael Bird and over the next 30 or so minutes I'll be challenging our panel of experts to take a different area of the IT ecosystem and, of course, explain it. In this episode we’re going to be talking about the rise of the robots, specifically how this is and will affect organisations and individuals alike. 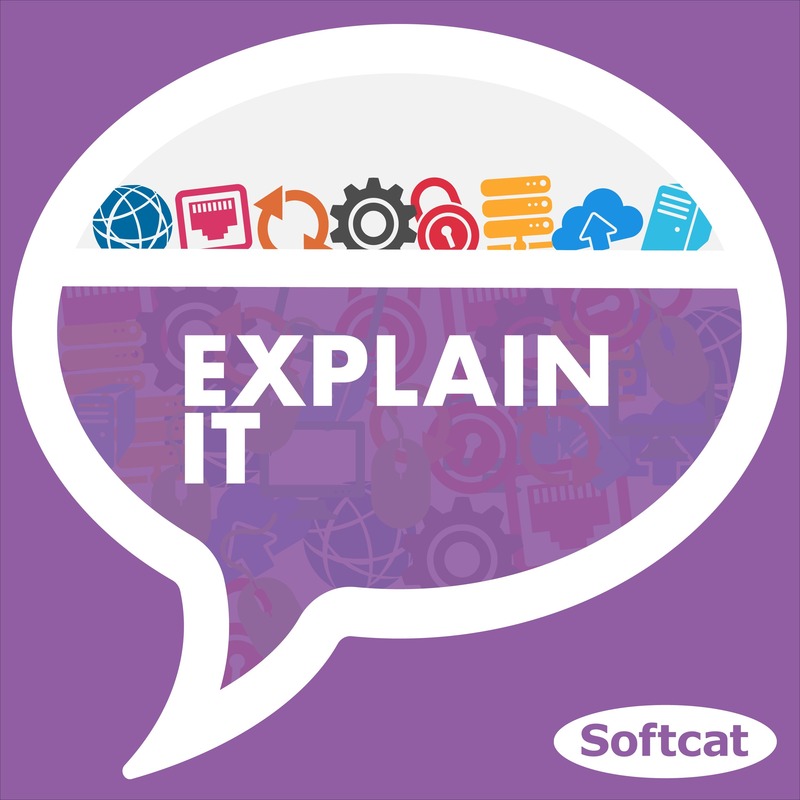 And to help us discuss we have Dean Gardner who is Softcat’s Chief Technologist for cloud, Dean this is your second time on series two of Explain IT, what is your interesting fact for this episode? Dean Gardner: I was in a band many years ago, recorded an album in 2004 and it is now available and has been available on digital download for anybody who wishes to seek out the Dees. Dean Gardner: That's the one. Michael Bird: Is the band still together? Dean Gardner: For drinking get-togethers, yeah. Michael Bird: What do you play? Dean Gardner: I write, sing and play guitar. Michael Bird: Sorry to laugh, that's brilliant. We've also got Joe Baguley who is Vice President and Chief Technology Officer EMEA at VMware. Can you just explain what exactly a vice president and chief technology officer EMEA at VMware does? Joe Baguley: So chief technology officer of VMWare CTO stands for two things. The first thing is Chief Technology Officer, which is 50% of my time and that is inbound working with our product teams, our development teams and doing what I call connecting R&D in the field. The other 50% is Chief Talking Officer which is this and all the other stuff that I do which is sharing our strategy, making sure that our customers and our partners are understanding our strategy. Michael Bird: Excellent. So we ask all of our guests to bring an interesting fact, so what is your interesting fact? Joe Baguley: My interesting fact is I'm the current reigning UK champion of champions for fireworks. Michael Bird: So explain how that works. Joe Baguley: There's a competition every year in Plymouth. People enter teams and so I'm part of a fireworks company called Star Fireworks and we won in 2010 which meant we went back in 2013 to compete to be champion of champions, which we won, and so we’ve had to wait six years until this year to go back and defend our title. Michael Bird: And that's what you are doing this year? Joe Baguley: So we’ll be back there in August to defend our title. To give you an idea of the scale of it, if you go and see one of your normal school fireworks displays, that’s probably about 25 to 30 kilos of explosives in that 20-minute display. We use 550 kilos in 10 minutes at the competition, it's big. Michael Bird: Wow. Ok so let's get on with the show and we talked earlier in the season, I think it was episode two, about AI machine learning we talked really practically about what it is but we didn't go into too much detail about the ethics of it all. So I guess my first question is will a robot replace the job of an IT professional? Joe Baguley: Yes, but in a way that it already has, and always will do. Dean Gardner: I think that's fair. It depends what the IT professional does of course, but a lot of tasks that happen in IT, it's fair to say, have or are being automated. Understanding some of those tasks and then obviously using certain technologies to replace those tasks frees up those people to do more stuff with, essentially, the business they're working in. Joe Baguley: It's a process of abstraction, we continue to abstract ourselves and automate ourselves, and that's essentially what we do. As an administrator, as an IT professional, quite a lot of what you’ll do is, “I have to do this every Thursday, I'm going to write a script to do it,” and then I'm going to find a piece of software that does it for me and I'm going to find… and so on and so forth, so what you do is ultimately, you're not automating yourself out of a job, what you’re doing is automating the tedious part of your job so you can focus on the more interesting bits. And so you put that together with an increase in intelligent, clever AI based management software across all these systems and then you start to say, “ok fine, now I can automate away some of the boring stuff, I can now get involved in some of the new exciting stuff and why are you automating? Scale. You've gone from a sysadmin that managed four, five, six, ten servers, and knew the names of every single one of them and handcrafted and configured them themselves which is where I started, all the way up to now they're probably going to have to manage tens of thousands of containers as well as managing a whole bunch of VMs, as well as managing a whole bunch of elements across multiple clouds, and so as you enter into this multi-cloud world with applications distributed across multiple locations and at the same time when you look at it from a security perspective, which people don't tend to look at either, the world of perimeter base security is long dead, so you cannot do multi endpoint, multi cloud security without some level of automation. So the answer is yes, IT professionals will get replaced by AI, robots, whatever you want to call it, but they've been doing it to themselves forever and they will continue to do it to themselves and if you're not looking now at stuff that you do today that could be automated in the future, watch out because that's what I'm working on. I'm working on automating that and I present to VMware user groups all the time, and for many years I've warned them that the stuff you're doing today you're not going to be doing in five years time, which is true, because the stuff you do today is very different to the stuff you did five years ago. So I'm not being horrible here if you think about what you did today it’s very different to what you did five years ago, so get on that. Michael Bird: In terms of replacing people, why do you think that is, why do you think that's going to be happening, or that is happening? Joe Baguley: Well you're looking at two types of AI. There's generalist AI, or AGI, artificial general intelligence, whatever you want to call it that's essentially creating a human brain equivalent, we are years away from that. As in, an entirely autonomous operating human brain that does everything - we're long way away from that. Flip that on the other side, and you've got task-specific AI. What that is, is where we've got AI that is focused on one particular thing. Really good example, something like Google Home or Alexa, which if you've got this on a loudspeaker in your home, I'm sorry for what I just did. And what that is doing is that can make people think they're talking to an AGI, but actually they’re not, they’re talking to something that's really good at language and specific, but it can't do anything else than that. So we have to be very careful as we go forward of people not confusing the task specific AI that's particularly good, that can make you think you're talking to, or dealing with or whatever, some kind of human and something that actually is a true AGI. So we’re a long way away from a true AGI that will replace everything you’ve done today including getting up out of bed, driving to work, whatever it is, but we’re certainly at a point where we can replace someone sat there talking on a microphone to other people, that can be done. Michael Bird: Presumably, where we are today, there must be some limitations like can AI, and can machines be creative? Maybe that's a bit more of an existential question about being creative. But can machines do that? Are we there yet? Dean Gardner: I'd say no. I know Joe’s chatted to us before about the way that a machine will learn and you have to put data in for that data to be essentially understood by the machine. But the key thing is the machine can learn and understand the context of the data as long as the data is in there and obviously it can cross-reference that data quicker than a human brain, but it needs to be tasked with that, essentially. You can get an answer to something quicker and we're seeing that in the legal profession, we’re seeing that in medical and other sections of industry that's taken advantage of being able to run through loads of data using very heavy compute processing to produce an answer quicker than we could ever comprehend or even read. So that’s kind of where it is today and we're seeing a lot of organisations try and take advantage of that kind of stuff. Joe Baguley: And I think that's the real rub of when you get to the ethics and where we are in terms of AI development now. I don't think AI are going to do what I call the arts and hearts piece, I really don't, I think that’s where humans are going to differentiate themselves from AI going forward, that creative piece, whether that's creating art, or whether that’s empathy or love or whatever those other unquantifiable emotions that we as humans have spent thousands of years trying to define ourselves, is almost something I don't think we’re going to get to with an AI. The reason why everyone’s so excited about AI right now is because of two things, we’ve got an ability to do large amounts of computation, we’ve got an ability to store large amounts of data which we didn't have before. The algorithms aren't new, either, so the concept around DNNs and the concept around essentially what's going on in this is stuff that we learning at university and the early 90s and before, is nothing new, and what we've got now is the compute power to do it and the datasets to pump through it and the datasets are great because they’ve come from a large number of humans connecting themselves to the internet and basically uploading pictures and everything about themselves to these huge datasets and the compute, obviously, cloud and we all know that story so you’re finally you’re down to this point where we can actually run these experiments with large datasets, etc. And I think the best way to describe what the difference is, is I can get a four-year-old and show them three pictures of a cat. Three different cats, go cat, cat, cat, and they go, “ooh, cat, cat, cat,” and then I show them a fourth picture and they’ll tell me whether that's a cat or a dog. You can't do that with the computer, I have to show it several hundred thousand pictures of a cat before it'll then even be able to possibly recognise a cat that it's never seen before and that's what I mean by we need these large datasets, and whether that’s large datasets of legal documents, whether that's large datasets of whatever teaching because the way that we structured DNN, the way that machine learning works, the way the regression, the tuning works etc, we need to get these datasets and put them backwards and forwards through these machines multiple times to actually start to tune them. We can now do that, we can do that to a scale we've never done before, that's why we’re all getting excited about AI, because we’ve started to see these task specific AIs popping up doing these cool things that have been specifically trained or run a specific model and people get really excited. Michael Bird: Let's take this down then to an organisation level. What can an organisation do to ready themselves for this rise of the machines? Or maybe the counter question is, is it already here? Dean Gardner: So in some industries yeah, things like cars and car factory lines or my brother-in-law works for a company that produces paints, and there's loads of automation and robots, if you like, and human interaction in those and they've been doing that for years, and then go back a hundred years ago when they were making cars, it was all people. As the time's gone on, robotics and automation have taken over to do some of that and obviously you look at the way they run their businesses and it's all taking that data and having to learn how to do things better, so I think a lot of those organisations have already been using automation and robotics in their manufacturing and obviously now what they’re trying to do is do stuff that learns from what's happening within those environments to create efficiencies and improve those things. So I think it's been around for a while, it's just evolving and it's now starting to touch into almost white collar business and I think that's the difference really, is that organisations now are starting to use cloud and compute processing to do stuff that historically, probably you wouldn't have thought was relevant or possible, and I think that's kind of where we are a little bit. Joe Baguley: It’s that famous quote about the future’s already here, it's just not evenly distributed, right? So all the stuff we’re looking at already exists in pockets. We've had automation for years, is that really AI? Is that robotics? I'm not sure because it's not exactly getting insight, it’s just automation. I think what we’re looking at now, is, the good word is insight, where something gives you insight into datasets, and so specifically if your question, how can people prepare themselves, how do enterprises prepare themselves, well, actually you need to start looking at the data your enterprise has and make sure that it's accessible because if you truly want to gain insight into using AI to change what you do as a business, then you need to feed the machine data, so you need to make sure that your data is easily accessible, packaged up, whatever it is, in a way that's going to provide rapid ingestion and insights. I'm seeing a lot of work at the moment in companies as you start to look across their datasets and start to pull things out and that explains the rise of companies like Mongo and others, and they start to put these layers across these datasets to make it almost easier to play with, so that's one way you need to prepare for these kinds of things. The other thing is we’re looking at where can insight make a difference and you talked about moving up to the white collar space, that’s a really interesting point because most people seem to think that it's, it’s very classist, but it's the blue collar, it’s the lower end jobs that are going to get replaced, well to a point, so yes we've already seen those, you've got automated tills at Sainsbury's, but when you look at what actually is going to really hit is the middle management staff, and so this is where the AI piece becomes interesting, because I don't need AI to replace those jobs, AI starts to replace some of those type of jobs in driving etc as we go forward, but the middle management piece is where they need to be really scared, and what I mean there is if you think about how management works in most companies, you've got a layer at the top that runs the company, makes strategic decisions, you've got the layer at the bottom that's doing the real work, whether that's going out doing the sales or whatever it is, if you think of the context of something like Softcat for example, and in the middle there's a bunch of people managing things. Now what managing things actually is, is taking a bunch of data inputs of making decisions based on those data inputs. So you think actually, how much of the managing things could I replace? The example I always use is restaurants. The job of a restaurant manager is to say, “ok well it's Thursday coming up, and Friday, I’m planning ahead for the week so I need to make sure I've got the right staff on at the right time, I've got the right amount of food in, and I'm going to look at the weather, etc etc,” those are all things I can do with a computer and all those insights and decisions are things that I can then do with a computer. Now does that mean the restaurant manager gets replaced? Probably not actually, what it means is, and this is where we get to the crux of what we’re talking about here, it means we can augment restaurant managers with better intelligence. So the boring stuff like working out the rotas and working out how much food to order can become automated, so then the restaurant manager can focus on the arts and hearts part of the job and be better at being out front of house, making sure customers, and improving the service level, rather than if you go to most restaurants, they’re sat out the back looking at spreadsheets and playing with paper. So you think across the board in this white collar world, where can we improve the arts and hearts element and enable the humans to spend more time on that, more time managing their people, more time making sure the customer service levels are up etc, etc, and less time on the administrativia, which we can automate using AI that provides insights on data. Dean Gardner: We’re seeing that a lot of our customers at the moment where organisations turn round and say, “we want to look at cloud technology, we might want to leverage some of that capability, how can I use that?” And so we’re being tasked with understanding what they're doing - what do your users use on the desktop? What do your users do within your organisation to provide the service you’re doing to your customers? You’d expect the organisation and the teams we’re talking to to know some of that, and it's amazing how many just don't. So it's getting under the hood of what you’re doing as a business to serve the customer or the consumer, and when you challenge that and you start getting into that world, that does become quite disruptive in some cases. Joe Baguley: I think about that point talking about the customer service element that really makes a difference to me for customers for how I engage with organisations, because if you think about it in your daily life, a lot of what we now do, the choices we make, or the companies we deal with is, to a large extent, based around the service level that we get from them and the experience, rather than the product and so when I see this focus in the industry of, “So we can use AI for chatbots, and we can have all the humans that we sell to to be talking to computers,” and you think well, actually what if you used AI on other areas of your business that enabled more humans in your organisation to spend more time with your customers, that might be better. Michael Bird: So are you saying that with the rise in AI machine learning and machines replacing some tasks and some roles, actually what we're going to see more in organisations is less, just stuff being automated for automation’s sake, actually it's going to be used to provide a better experience to their customers. Joe Baguley: So it's about empowerment, so it's about augmenting humans with other technology. So if you go back in history, let's go back to before any technology whatsoever, literally nothing, it was the whole human race was based on muscle power. If we go back to tribal times, back to thousands of years, the people who were in charge are the people who were the largest bloke in the village, was basically the boss because they smacked everyone else about, and ultimately other people got alongside them with more muscle and they augmented their muscle with other human muscle and that's how you ended up with the system we have today and we can get into the all property is theft, but that’s a whole separate conversation… Ultimately, they beat up the village next door, got bigger and so on so forth. What we had was humans competing on muscle power, then what we did was we started to find ways to augment our muscles with, first of all, other muscles from bigger stronger animals and then we decided we could build our machines that could replace that muscle so suddenly that’s when factories, the Industrial Revolution happened. If you look at the Industrial Revolution, it's part about automation, but a lot of it's about replacing human muscle power with steam and other things that actually provided energy to create things in a more intelligent way, so ultimately we were augmenting the only method we had of actually doing things we wanted to do which was to eat food and turn it into power in our muscles to actually creating machines that augmented us – so if you think about that, we actually augmented ourselves as humans with muscles, so actually now it's not who's the biggest bloke in the village, actually it’s now who's the brightest bloke in the village, because who’s the one that can think best about how to use these machines to their advantage in a way that makes more intelligence, and that's the industrial revolution in a nutshell is the bright and intelligent people, not the necessarily the strongest people, were the ones that won. That then allowed one, more leisure time and allowed intelligentsia to rise up, but then we started to say, ”what's the next phase after that?” and you can hear we’re in the second Industrial Revolution, the third…somewhere in the fourth, I don’t really care! But basically what’s happened since is we've had this knowledge explosion with the use of computers. So now what you've got people doing is starting to not compete on brain power anymore because of what we doing now is we’ve augmented ourselves in the muscles and that's it, so now we’re competing on brain power and now I can have an augmented brain. Remember when you were at school, for the old ones in the audience, you had a calculator and had that argument with your teacher, and the teacher used to go, “well you’re never always going to have a calculator in your pocket, are you? You need to learn how to do this.” And well, no, we all walk round with calculators in our pockets, and actually, more importantly, we all walk round with most of human knowledge and an incredible amount of everything else you can imagine connected to us in our pockets in a mobile phone. So we’re all augmented humans here today. So what do we compete on next? Because we've augmented our brains. So that comes back to my arts and hearts point, so now back to the point what you're now seeing is people competing on the arts and hearts piece. And what's the arts and hearts piece? That service, it's how you feel. Michael Bird: And so do you not think a machine would ever be able to do to the arts and hearts stuff? Joe Baguley: No, honestly I'm taking a stand on that, I don't think they will. Michael Bird: What about if you’re on a telephone conversation with someone and that someone is a robot, but you're not aware of it. Dean Gardner: Well they’re trying that at the moment. They've created studies where you react, the way they talk and change, based on an emotional response. We’ll probably get there, I think that's where we talk about the morals and the ethics. I don't necessarily think it will sit very well. Michael Bird: Let's just talk practically then, for organisations. How, practically, can they prepare themselves for this? Is it a thought process? Is it something they need to purchase? We talked about datasets, is it to do with that as well? Dean Gardner: To me it's very much data driven. Number one, I do think there is an element where organisations need to understand what tasks people are doing, because there are tasks that can be automated. A lot of stuff that people do in a given week, do they necessarily need to continue to do it manually? And that's not so much AI, but that certainly is there a machine that could do something in a repeated task, model? And that is a yes. And I think if you get to a point where you can take over those repeatable tasks and automate them, that's when you can start doing some of the stuff that Joe mentioned earlier. As a business, start focusing on the person you're providing your business for, and I think that's where a lot of organisations, they’re nowhere near that, because they get into a habit of just doing what they do because that's what people do, they come to work, they do what they do, they go home and actually challenging that. Businesses, if they want to change and transform, in most cases, they have to start looking at that. Michael Bird: And at what point do they look at their workforce and review their workforce and say, “ok well these are some of the jobs that we can maybe augment or replace”? Joe Baguley: That should be a continual process, I mean I wouldn't see where there would be a point where you start or stop that. That should be something you do in an organisation. Ultimately I think the bottom line here, Dean’s spot-on, get ready for automation. And the point is actually if you're getting ready for automation now, what the hell have you been doing for the last 25 years? Dean Gardner: Look at retail - we always cite back to the retail market, and you see how disruptive technology has been to that and that continues to and a lot of it’s down to the fact that a lot of the High Street stores they've just gone… it happened in the music industry, “ahh, it won’t affect us,” and the fact is it's because they never looked at it, they never looked at what they were doing, but someone come along and say, “we can do it better”. Joe Baguley: Retail is a really good example because I'm fed up with people bemoaning the death of the high street and that's been bemoaned since we had a high street. The interesting thing is the high street is evolving with technology and it’s evolving with society. So people complain… let's look at Marlow, where Softcat’s based, people continue to complain that all the shops are shutting down and everyone’s opening coffee shops. Yeah, that's what's happening, because shops that sell things don't make sense in a lot of cases anymore because I can get those things delivered to my front door because I can order them from my mobile phone from home, so why would I bother going to a shop to buy a thing? What's the high street now filling up with, well it's filling up with services and experiences that I can't buy on the internet or get delivered to my house. That's a change in society and that’s a change in retail, thanks to technology. Now if you want to flip that and go, “ok fine well what's happening in organisations and customers?” it's the same story, things continually change and so you’ve got to map to those changes. When you look at that and you go, “ok this now talks to organisations and it talks to individuals. How do we prepare ourselves for the future? Because the future is going to get changing faster and faster. So what do I have to do? Well I have to be, and the keyword I'm hearing more and more is resilience. I have to build resilience in to my organisation, I have to build resilience into my people, I have to build resilience into myself, such that as change comes, I am resilient and adaptable to change. Michael Bird: Ok so we've probably covered this already, but can you give me a bit of a timeline as to where we are today, and where we're going to get to in the future and when that future is going to be? Dean Gardner: I said two years ago, could we have predicted we’d have certain jobs as we have today in our organisation? No. And actually, the people who run our business were going, “why do we need that?” You can make some short-term predictions, but the industry is changing and it’s moving so fast, so how do you then say, “I need ten of this for something that's going to happen in two years,” it doesn't work like that. So it's how you react and how you adjust what you're doing as a business to meet the consumer or meet the customer and we’re having to do that. And the only way we can do that is by harvesting and managing the data, and then see where the trends are. And at that point you've got to be in a position where you can move. I do think there's a technical skills challenge in the world anyway; there’s gaps in terms of what's required and I think that’s potentially stifling certain change. And I think that’s the biggest blocker of accelerating that change, is technical skills and education even at school level, I think there's a gap and that's partly because you can't predict. Joe Baguley: And I think it was Niels Bohr, the quote was, “prediction is difficult, especially about the future,” which I like quite a lot. You’re spot on, I think the future prediction bit is difficult, but it comes back to what I said about resilience and it really is about resilience. You talk about school curriculums, is very important, when, often in my position, as I'm sure you do, get asked, “is it important to get kids to do coding?” and all this kind of stuff, and I’m like, “no, actually I don't think we should teach our kids to code,” and why not? Well because by the time the kids we’re teaching now to code get a job, they won't need to code because the computers will be coding themselves. I think if you're preparing yourself for the future you need other skillsets. I’m on a lot of panels where people say, “if you go back and do it again what would you study?” And a lot of technologists sit next to me and say they wished they’d studied psychology or something along those lines, because ultimately, if you look at this conversation we've had a lot of it comes back to human interaction. So how do we prepare ourselves for the future and what's the future going to be? I don't know, there's no timelines to it, people can't get, even the best people in the world can't get the timelines. Elon Musk has been promising full automated driving now for three years, that he's promised that he’s going to drive from, he’s going to do this automated drive from one side of the country to the other in America, and that still hasn't happened because of various problems they keep hitting. It’s not failure on their part, these things are hard and they're going to take time and things are difficult to do, so there's a whole bunch of interesting stuff going on, but timelines? Who knows really, it's not the time to say. Dean Gardner: But it's happening, it’s going to happen, things are going to evolve and you need to adapt in some way to that change. And also I think there's an element of education and learning yourself and I think there’s a responsibility, certainly in the role that I do and Joe does, is that we've been doing IT for a long time, so there's foundational skills that we've gone through the last 25 years with, which has got us to the point where we understand token ring networks. But the point is, they’re not relevant anymore, but it just gives us the foundational skills I think to learn, and that's what we’ve had to do over the years. I certainly have had to learn and evolve myself to understand what's happening and I think we have a responsibility individually to do that. Joe Baguley: There's a resilience, and people ask me - mentoring and other stuff­ - what makes you a CTO? And I say it's a never-ending curiosity and a fascination with tech. People like myself are going to be up there always at the front with this never-ending curiosity, this fascination with tech, I’ve always wanted to play with the latest things, find out of the latest thing is, learn it, understand it, work out how I can make the most of it and move on. How do you teach those skills to others? I don't know, I think you do it over time but there's a passion thing in there that's very different. From an organisational perspective, how do you get an organisation passionate and curious? That's really interesting. Dean Gardner: But that comes back to the human piece, inspiring people to want to change or to evolve and inspiring them to be curious and not to be fearful of that, or fearful of change and I think people need to, in business, understand that it's happening, and it's how you address that and the resilience I think is a good point about that. Joe Baguley: Fill your company with people smarter and more curious than you. Those curious and excited organisations are the ones that are going to win. Michael Bird: Ok so to summarise? Joe? Joe Baguley: Well I think if you look at the whole conversation we've had, whether you're an IT professional or whether it's just talking about general day-to-day human life or whether it's how your organisation is going to change, it's a story of augmentation. It’s a story of improvement, and it’s a story of how do you use technology to be better, to do better, to do bigger, to do faster or whatever it is and I just think we shouldn't be scared of what we’re talking about here. Everything we've talked about, there’s going to be ethical concerns, there were ethical concerns with the printing press - all technology has these ethical concerns. But ultimately, not to be afraid of it, wherever you are, whatever you do, whatever you're thinking about, how do I use this to augment what I'm doing? How do I use this to improve? And a lot of this is a conversation we've gone through, has come down to improving human interactions and I think that's really important because you're seeing a lot more focus nowadays as what we doing on human interactions, on service levels, on all those kinds of things, so this is just going to help that. Dean Gardner: So we talked about how you can give more emotional, free up people to do more and inspire and make them resilient. But ultimately the future is unknown - we don't know what's going to happen, it's difficult to predict. But all we know there is going to be change, and it's actually being able to meet those changes in the way that’s a positive and not a negative and focus on the good and not what the bad is. You’re going to get things that happen, there’s going to be, as we've mentioned, ethical dilemmas, but it's being able to plough through those things to actually provide something that's better. Society that's better, a world that's better and technology should be a force for good and I think we should focus on that and that's the only way we can try and help the future as opposed to predict it. Michael Bird: Well Dean and Joe, thank you so much for your time, it's really fascinating talking to you both. Listeners, if there is anything in the show that has piqued your interest, do check out the show notes, we’ll provide some useful links and more info related to what we’ve covered in this podcast. Also, make sure you click subscribe wherever you get your podcast and we'll deliver the next show to your device as soon as it lands. So you've been listening to Explain IT from Softcat. Thank you very much and good bye.